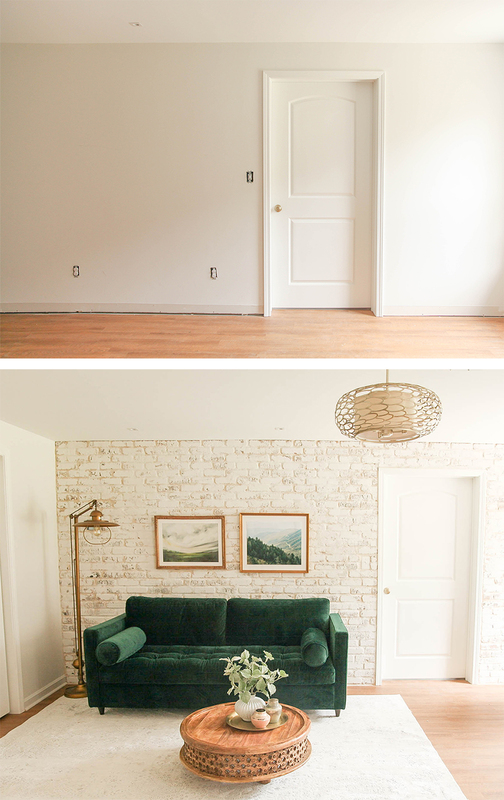 This past month, we worked with Emily Harris and North Georgia Brick to take a standard dry wall in our studio room and convert it into an aged brick wall. (Or as close to one as you can get without it actually being aged!) We have worked with Emily before on our dining room walls, and love how it transformed the entire feel of the room. 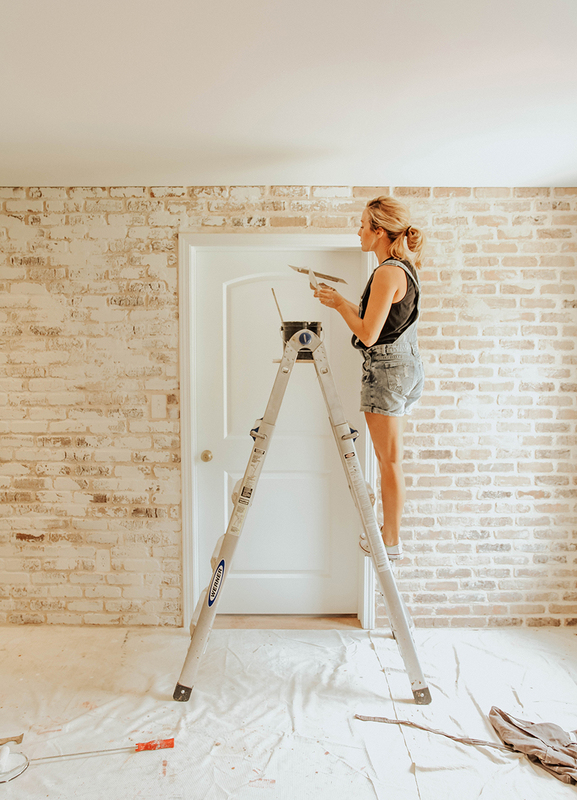 Our area doesn’t have any homes older than early 90’s so we thought we would tackle the challenge of making a space your own outside despite it’s standard build.We are sharing a timelapse video today of the entire room from start to finish…. We picked up our thin brick supplies from North Georgia Brick since they had a wide selection of colors in stock. We used Ironworks since it was a lighter tone. We used Mapei Type-1 tile adhesive to get the brick on the wall, and chose the lightest shade mortar to use with Emily’s finishing technique. She uses a specific process and mix of materials that are unique to her brand, and she is available for custom work anywhere in the U.S. I really loved the brick look before we added the finish work as well, but I knew for this particular space we needed brighter walls since the room only has two windows for natural light source. I am someone who needs a brighter environment to be motivated to work! I also wanted to share more about this emerald beauty! 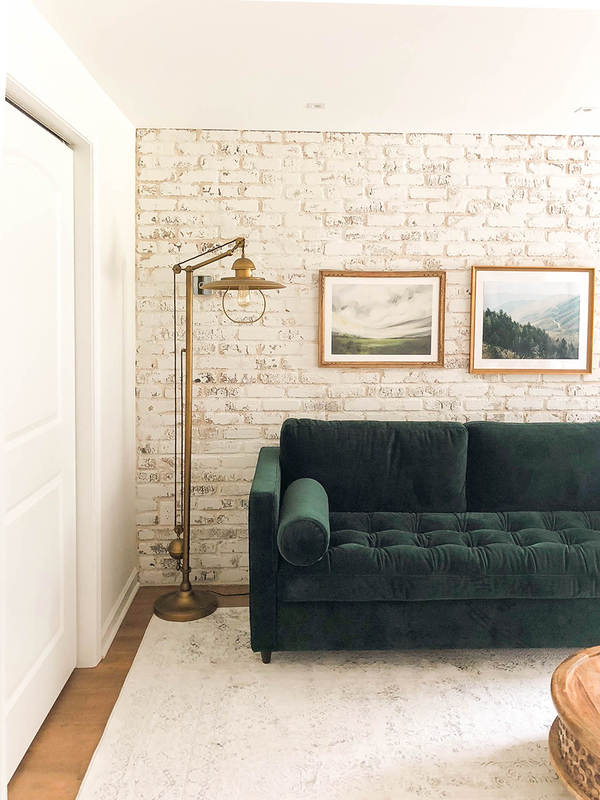 I’ve never been able to get a deep emerald velvet sofa out of my mind, so when I went hunting for a sleeper sofa for this area and saw the Briar Sofa from Joybird I almost fell outta my chair. Is is it kid proof? No. Will I probably pay for it? Yes. The heart wants what the heart wants though as Selena says, so hopefully it at least offers our guests a cozy boutique hotel feel when they stay. Since this room will also have little ones running through, the only option for a coffee table was one low to the ground with safe edges. 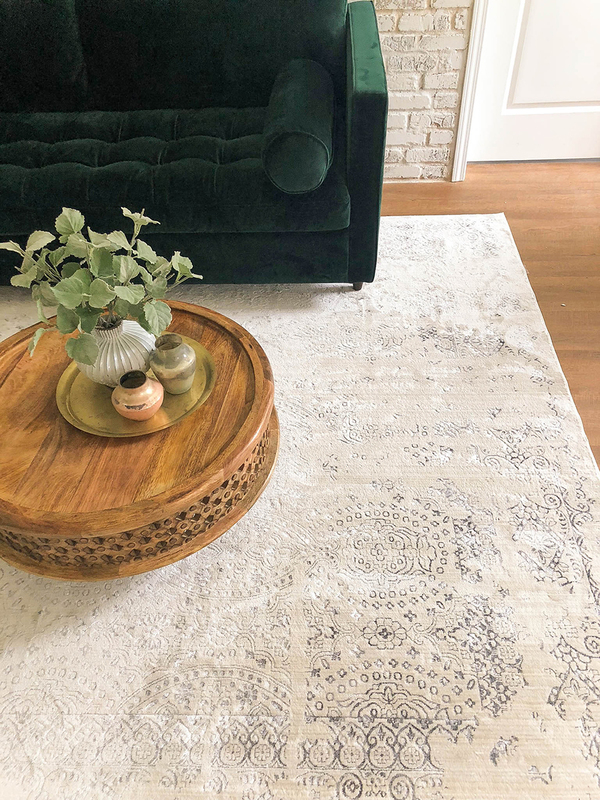 I have had this West Elm coffee table pinned for over a year, and it was on clearance, so I bit the bullet. It was just what this space needed. Lastly, I wanted to keep the artwork in this corner simple and calming!I am such a fan of Emily Jeffords work, so I brought this print down from the living room, and paired it with our new Mountain Valleys print download from the IHOD shop. I look forward to sharing the desk side of this room soon! Any questions? Leave them below! DIY large scale wall art. I love this room! I need a wall like this in my life! Gorgeous! You did it again!